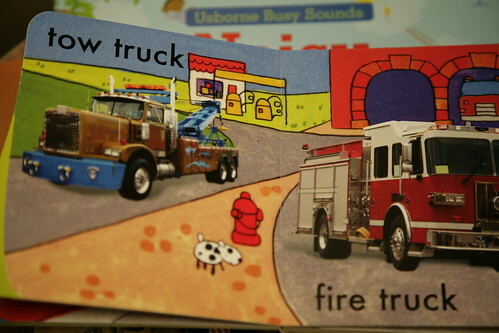 Inder Loves Folk Art: Pro-development books for babies. Until recently, Joe was never much of a reader. Two pages into every book, he would run away and get back to his usual activities - harassing sleeping dogs and throwing stuff - leaving me to finish up by myself. Which I often did, because ... well ... I'm a nerd. I want to know what happens! But recently, Joe has been pretty excited about books, and frequently makes it THREE WHOLE PAGES into a book! Very exciting! 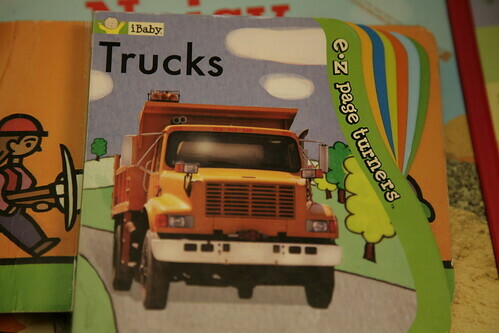 Joe seems to especially enjoy books about trucks and earth movers (things he loves in real life, too), so, eager to encourage any kind of book lovin' in my little bruiser, I went out and bought a bunch of books about trucks and construction equipment. Which Joe loves. Just some pictures of trucks. Nothing too controversial. 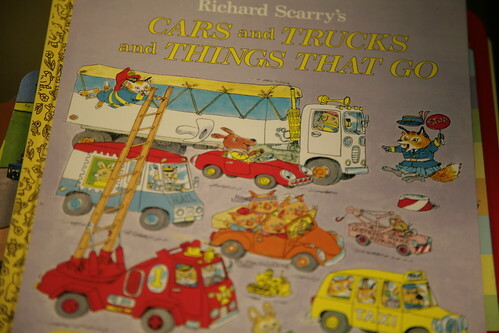 That tow-truck is enormous, the kind that can tow other enormous trucks! 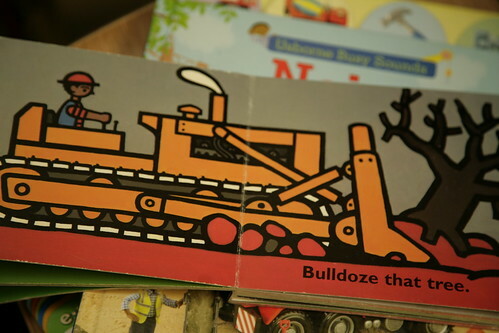 This one makes construction machine noises, which Joe loves and Crouton HATES. 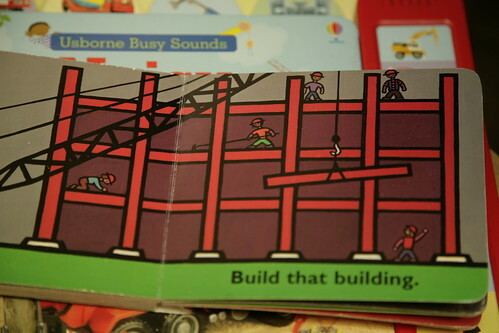 It's great that it represents construction workers of all different races, and even includes some women workers. 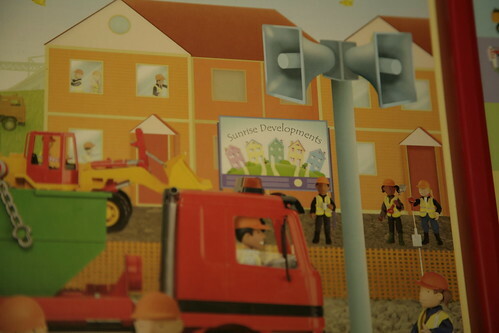 But then you find out, at the end of the book, that the workers are building an ugly residential subdivision! Which is called "Sunrise Developments" and ... well ... ugh. Don't these folks know that the residential housing market is totally stagnant right now? 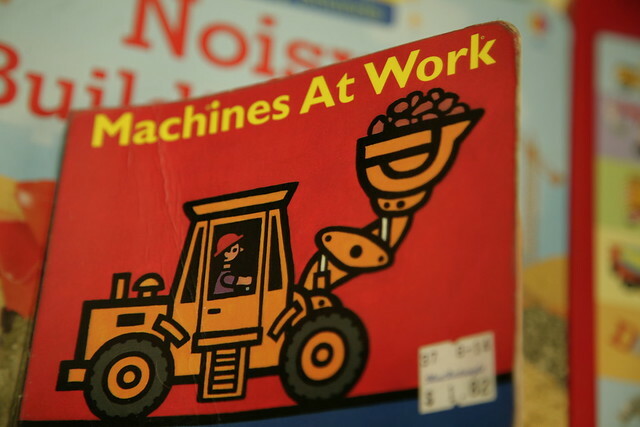 But as far as pro-development propaganda goes, Joe's absolute favorite machine book, Machines At Work, really takes the cake. It has colorful, vivid pictures, and short, punchy sentences. Like, "Knock down that lovely building designated on the National Registry of Historic Properties!" And, "Bulldoze that 200-Year-Old Native Heritage Oak!" And, "Build that Giant Eyesore Parking Structure!" Yikes. Clearly not the most environmentally friendly message! 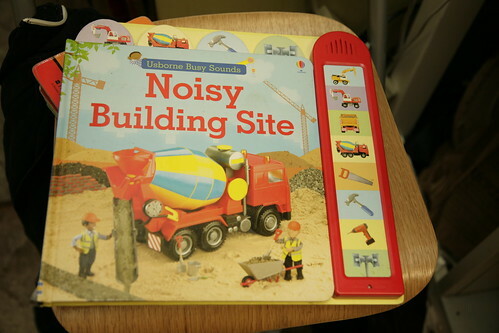 So I've decided to write an Environmental/Local Government Lawyer Board Book, which will present a more balanced view of development and construction, and will include exciting captions like "Prepare Environmental Impact Report!" "Seek Planning Commission Approval of Tentative Subdivision Map!" "Vest Those Entitlements!" "Mitigate impact to the Red-Legged Frog!" and "Record Conservation Easement on Adjacent Marshland!" Maybe it will even show the construction of pedestrian- and bike-friendly, mixed-use, public-transit-accessible, infill, brownfield development? Archaeological and biological consultants will visit regularly to inspect potential archaeological resources, mark drip lines for Heritage Oaks, and check for nesting raptors. Giant water-sprayers will keep construction dust at a minimum, and big dump trucks will remediate the hazardous wastes in the soil (which were caused by an underground gas tank, of course - it's a brownfield). The final development will feature clearly marked bike lanes, drought-friendly landscaping (watered with reclaimed water, of course), recycling bins, and municipal compost. Oh, this is going to be SO COOL. Haha! We have Machines at Work also and I have always given my own reading-- very similar! 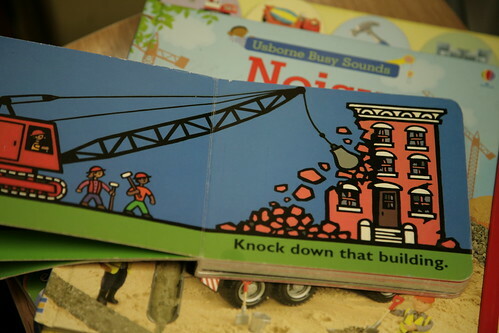 "Knock down that beautiful old building." "Bulldoze that gorgeous tree." "Maybe they are putting in more bike lanes sweetie? Do you think? Ooops, nope. Another ugly building." "Look! They are getting a lunch break! Thank goodness for the unions!" I do love the work ethic represented in Machines at Work, like, "Hey guys, let's get to work!!" YAY! And "Let's eat lunch!" YAY! And at the end, "More work tomorrow!" YAY! The building was obviously seismically unsafe, the tree was obviously dead, and a parking garage is better than a 2-acre parking lot. I'm sure they intent to put bike parking and EV charging stations in it - they just opted to not put that in the book. What's the baby sign for "Vest those entitlements?" Well, maybe they will stick a Starbucks at the base of the parking garage, call it "mixed use" and win a prize for being so forward thinking and progressive! Sheesh, and I thought I was cynical!